We use brushed chrome hardware on all of our murphy beds and cabinetry. 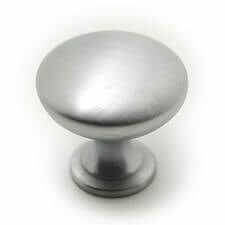 Knobs usually used for "Doors or Drawers"
Depends if your cabinets are wide or narrow will be the difference of which size handles to use. Pulls usually used for "Doors or Drawers"
Regardless any size you use. The fit is just for esthetics because the doors/drawers are easy to open. You also have the option to use your own hardware if you pre-purchase it, we can install it for you.